From a personal standpoint, 2015 was pretty much one for the crapper. The highlights would be Rebecca getting her troublesome gallbladder removed, something that had to be done to keep her alive...but now there seem to be lasting side effects. Also a highlight would be me getting on medical insurance, since the Affordable Care Act actually made our insurance cheaper. This allowed me to get on pain medication for the chronic pain that was pretty much destroying my quality of life. There were other highlights like birthdays and Eryn being named an Aurora Scholar, but for the most part, 2015 sucked. We had three visits to the ER, one surgery, and one extended hospital stay that even with insurance are costing us thousands of dollars. We also had the custody battle, which is finally resolved, but that cost us thousands of dollars in legal fees. Neither one of us makes much at our "real" jobs, so this has put a huge strain on us. Now as the year comes to a close, we find out that Rebecca's company is being bought out by the end of next year, which means she may be out of a job by this time next year. There were certainly times this year when the only thing that kept me going were the love of my amazing wife and our wonderful girls. Professionally, this year was a mixed year. I actually wrote a few stories, none of which have sold yet. In a lot of ways, I feel like a new writer starting all over again. As an editor, I edited a collection called A Robot, a Cyborg, and a Martian Walk into a Space Bar, which has done fairly well. It's not a bestseller, but we have made money off of the book. I also edited Quantum Women by Tyree Campbell which came out towards the end of the year. This year has also seen the growth of The Fifth Di..., a zine which I've edited for more than a decade. Starting next year, the zine will actually be released in both electronic and print formats. The coming year will also see the release of a collection by Laura Givens that I'm editing, a novel from Tyree Campbell, and two collections. In the game design world, I've created several new supplements for the Ephemeris RPG, and there are some exciting new things coming for the game in the next couple of years. Spaceports & Spidersilk features some of the best science fiction and fantasy fiction and poetry for kids of all ages. The January 2016 issue will take you to places you might never have imagined. It will appeal to your inner child, and hopefully take you back to the places you loved as a child…and if you’re still a child, it will open your imagination to all kinds of new worlds. Christmas has come and gone, and we actually had a very good Christmas this year. Given how crappy the year had treated us so far, I was a little worried about the holiday, but things went well...other than Rebecca being sick, which because of all of the hours she's having to put in at work almost seems to be the norm. The kids didn't get quite as many presents as usual, but they seemed to like them even more than usual. We all ate too much, played lots of games, and watched Harry Potter movies all day, so it was a good time. Once the weather warms up, I'll be walking around in my Boba Fett letterman's jacket, and I'm walking around the house now in my R2-D2 slippers. Most importantly, we enjoyed being together as a family, which is the most important part of the holiday season, no matter what holiday you celebrate. Now reality has come back. Rebecca is at work trying not to cough up a lung, and when she gets home, I'll be off to work. Some things never seem to change. I've been reading all of the posts from people who have seen the new movie, and if you don't know what movie I'm talking about, then move along, this is not the blog you're looking for. I can't wait to see the movie, but we will be waiting anyway. Rebecca deals with PTSD, and we're coming up on the anniversary of the day she was held up at gun point, so needless to say, a large crowd would not be good for her right now. In addition, we haven't been to a movie since that lunatic decided to massacre a bunch of people at the theater down the street from us...the theater where we had our first date. So, that aggravates her PTSD even more, and I won't do that to her...not even for Star Wars. Yeah, folks, I love her that much! Some people have asked why don't I just go by myself, but that's not what we do as a family. We actually enjoy spending time together, so I will wait...probably not patiently...but I will wait nevertheless. So, please, DON'T TELL ME ANYTHING ABOUT THE MOVIE!!!!!!!!!!! There are only two weeks left in this miserable year, and I would certainly say that I'm very happy about that. This year has been awful for our family. We've had three ER visits, one surgery, and one extended hospital stay, which have all added up to a lot of medical bills, and even with the lower rates we got as a result of the Affordable Care Act, we still owe a lot of people a lot of money. Add to this the fact that we racked up a lot of legal bills in Rebecca's recent custody battle, and things only get worse. Even though I only work part time, my hours have fluctuated greatly throughout the year, and even though Rebecca has been putting in an insane number of hours, her company is merging and she could be out of a job by the end of next year. At the beginning of 2015, we had talked about this being our year. We were going to finish up taking care of outstanding debts, and start putting aside money so that we could get a house in 2016, or maybe 2017, depending on the housing market. We now find ourselves deeper in debt, and that dream of a house is now on the distant horizon. DriveThruFiction has a bundle of our fiction titles in PDF format that you can download for just $12. You get two novels, two anthologies, and four short story collections. That's more than 300,000 words of fiction for just $12. Reading through all of this would be a great way to spend your holiday vacations! We're very excited to announce some changes that will be coming to our long-running zine The Fifth Di... in 2016. First of all, the zine will still be available as an electronic zine, but it will also be available as a 6X9 print magazine. Contributors will receive one copy of each. It's our hope that adding the print format will allow us to eventually add more stories, bring poetry back, and increase our payments for contributors. Second of all, we've changed our pay rates slightly. We've lowered them for shorter stories, but increased them for longer stories. The Fifth Di..., one of the longest running on-line zines continues on with four new stories. This month we feature fantasy and science fiction stories from Kate Runnels, James Van Pelt, Matthew Spence, and Robert J. Mendenhall. Read a sample at http://www.nomadicdeliriumpress.com/tfdsample.htm. While doing some "housecleaning" on a variety of websites yesterday, I realized that I hadn't updated my Amazon author's page in a very long time. The page said that we have one cat, when we now have three, and it also only had 12 titles listed, which is a long way from being true. So, I went through and updated everything. Now most of the books I've been involved with should be on there...this includes my novels, short story collections (including the new one), Ephemeris supplements, books and magazines I've edited, and all of my individual short stories that I've released for Kindle, which now brings the title count to 99. I guess I should put another short story up, just so that I'll have 100 titles. Starting today, and going through Cyber Monday, you can get all Ephemeris titles for 25% off at DriveThruRPG at http://www.drivethrurpg.com/browse/pub/2805/Nomadic-Delirium-Press. It's time to stock up on the products you need to complete your game, or if you've ever wanted to start playing...now's the time! As an author, I've always thought that NaNoWriMo would be an interesting challenge. I'd love to write a novel in a month, but the simple truth is that I just don't have enough writing time in my life now to really take on such a challenge. I don't get to write every day like I would like to because of responsibility or overwhelming noise. It's my hope that when the little one starts school next year, I'll have more opportunities to write, but that's still a long way off. It's hard to believe, but today is Alexis' 5th birthday. It seems like only yesterday that we brought her home from the hospital, and now here she is, a young lady. Time goes by far too fast when it comes to kids. Eryn's only a few years away from graduating from high school, Jul's about to start middle school, and if Lex had been born a few weeks earlier, she'd already be in school. I really don't know where the time goes. She's become such a unique little girl. She loves her dresses, but at the same time she loves her Ninja Turtles. When she's playing with dolls, they might be having a tea party, or they might be getting eaten by her big T-rex, you can never be too sure. She has enough energy to power the sun, and she wears us all down just watching her, but she loves to sit and learn at the same time. I finished the rough draft for a new short story today. Several years ago, this wouldn't have been that big of a deal, as I was writing stories all the time, but now I don't write anywhere near as much as I'd like to. The simple reason for this is that editing and game design pay better, and they pay in a more timely manner, and simply put, we always need the money, so now finishing a story is a big deal. I've really missed writing, and even though mounting medical and legal bills are sucking us deeper into our hole, the simple truth is that I'm a writer first, and an editor and a game designer second. As such, I need to write. As human beings, we can't deny the passions in our life. If we do, what's the point of living, and writing is one of my greatest passions, so I will be doing more in the months and years to come. It's time to stock up on all of the products you need for your Ephemeris game. Through Nov. 13th, get all Ephemeris titles for 30% off! For the next two weeks, you can get several of our most recent e-books for 10% off at Smashwords. Quantum Women by Tyree Campbell https://www.smashwords.com/books/view/575947. Use coupon code GJ82U. 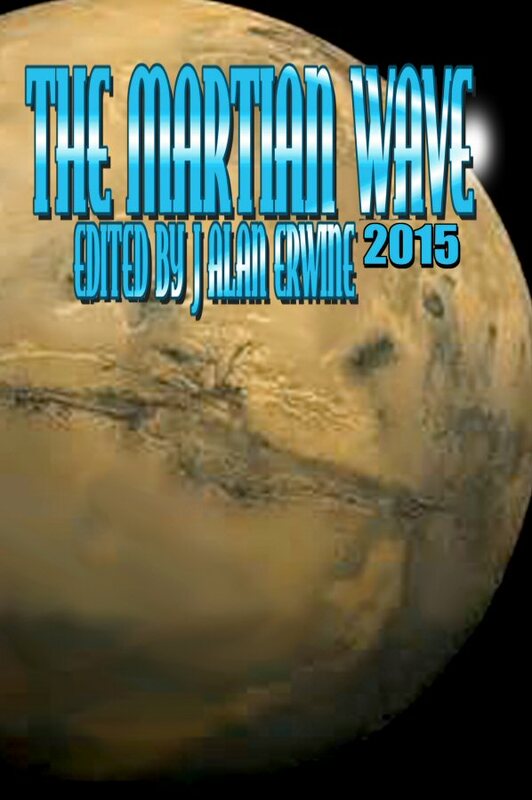 The Martian Wave: 2015 https://www.smashwords.com/books/view/561565. Use coupon code QQ84T. A Robot, a Cyborg, and a Martian Walk into a Space Bar https://www.smashwords.com/books/view/499752. Use coupon code LA97H. Taurin Tales https://www.smashwords.com/books/view/472428. Use coupon code WG32B. Another year of MileHiCon has come and gone. This year seemed to fly by even faster. We think it was mostly because we didn't stay at the hotel this year because we just couldn't afford it. It was great seeing a lot of our old con friends, but there were several people that we somehow never ran into. This year I had three panels and a signing, but for Friday night, I didn't have anything. We showed up a bit later than usual because there were other things going on. We went to the opening ceremonies and Jul and I were recruited into getting crowd members to be part of the opening ceremonies, which were based on "Guardians of the Galaxy." Saturday was a busy day for me. I started out with a panel on the similarities and differences between game and book publishing, which went well, which I think was true of all of the panels I did this year. We kind of got away from the main topic on this one, but we still gave out a lot of great info on game design and publishing. Immediately after the panel, I had a signing. Unfortunately, the signing table was not in the greatest place, and there was very little foot traffic in the area, so the signing didn't go well. In the future, we're talking about trying to get a Nomadic Delirium Press table in either the dealers room or on Author's Row. That might be a bit more than we can immediately afford, but maybe we can start selling a lot more NDP books in the near future. Immediately after the signing, I was on a panel about what got us into science fiction and fantasy. This was one of those fun panels, and there was a fairly large crowd. We all seemed to have a great time, but once we got on the topic of YA books to get kids into reading sf and fantasy, I was pretty much left out, as I never have read many YA books. I got into the field with some of the adult material. Still, it was a fun panel. Saturday night concluded with the mask parade, which the two younger kids participated in and the masquerade. I only had one panel on Sunday, which was about trends in publishing. This one was standing room only, and it was a great panel, although we certainly didn't agree on everything. During the Con, I was able to talk to one person about a secret project that we're going to start working on next year. It will be a long term project, and I can't discuss it yet, but I think it will be fun. I was also able to talk to Laura Givens about doing a cover for "Disharmony of the Spheres." We have a great concept, and we have the perfect model for the cover, a beautiful teenage girl who is a brave crusader for everyone suffering from depression. I think it will be truly awesome! DriveThruFiction is currently carrying a bundle of all three issues of The Martian Wave. You can get PDF versions of the 2013, 2014, and 2015 issues for just $7.50. That's over 100,000 words about the exploration and colonization of space. It's a deal you can't afford to pass up. What SF/F/H is the earliest you recall? Perhaps it’s Dr. Seuss, or The Twilight Zone, Maybe not the fairytales you were read––or maybe so––but the first you picked up on your own, the first that made an impression, that warped you forever. Our panelists share memories! Are magazines doomed? Will people even pay for content anymore? Are audio books making a comeback? What the heck do readers want these days? One thing I've noticed is that if someone tells another person that their child has been admitted to the hospital because they're undergoing testing for something like cancer, people react differently than if you were to say that the child was undergoing psychiatric evaluation and testing for depression. Why should this be different? Both are ailments, and both children deserve our sympathy, but the child being tested for depression is more likely to be looked at as being weak, or the parents are going to be looked at as if they've done something wrong. An important thing to remember is that most psychiatric disorders have a physical and biological cause. Most cases of depression are caused by a neurotransmitter imbalance, but somehow this is viewed as being different than abnormal cell growth causing cancer. Both of these illnesses have a very physical causative agent. It's true that life choices can exacerbate an already existing psychiatric condition. For example, continuing to date someone who is abusive can make a depressed person's depression worse. So, should we judge these people because their choices have helped contribute to their illness? Before you say yes, keep in mind that a lot of physical ailments can be exacerbated by our life choices as well. How many health issues, especially in America, are made worse by our eating habits? We usually don't judge people for making decisions that helped lead to their cancer (except maybe for lung cancer) or any other ailment, so why should we do it with mental health issues. Once again, until America wakes up and realizes that mental illness is an illness, not a weakness, we are not going to be able to solve many of our problems. And things like gun violence are only going to get worse. Please don't judge someone who is dealing with a mental health issue. You have no idea what they are going for, just as you don't really know what someone with a severe illness is going through unless you've dealt with it yourself. There's no difference whatsoever between physical health issues and mental health issues. No difference at all! In 2006, Sam’s Dot Publishing released an anthology about the effects of global climate change on humanity called Ecotastrophe. Now that it’s been almost ten years since the release, and global climate change still seems a possible threat to humanity, Nomadic Delirium Press has decided to release Ecotastrophe II. Like the original collection, this one will be edited by J Alan Erwine. What we’re looking for: We want science fiction stories between 3,000 and 10,000 words that look at the effects of global climate change (preferably the extreme effects) on humanity and the other creatures of Earth. We’re not looking for stories about the change, but rather the effects of the change. Although we’d love to have a lot of stories that look at the hard science of climate change, we also want stories that look at the soft sciences. It’s important that the stories focus on the people, rather than the science, but we still want the science to be plausible. What we’re paying: We will pay $10 for first rights to any story. We will also pay two contributor copies. If possible, we will increase this payment…but we can’t guarantee that. Where to send your little gems: All submissions should be sent to editor (at) nomadicdeliriumpress (dot) com. Your subject should be “Ecotastrophe Submission”. Publication date: We are shooting for a mid-Summer 2016 release. Other questions: If you have any other questions, please send them to the submission address. September was one of those months when quite a few royalty payments showed up in the last couple of weeks, and although none of them were especially large, they did add up to what seemed like a decent chunk of change. The royalties did, for a while, make me feel like this whole writer/editor/game designer/publisher thing was actually working out. Then I stopped and thought about it and realized that all of those royalties together were less than what I make in one paycheck from my awful "real" job, and then I was sad. There's so much more to do in life now that we have a high schooler in our home. In addition to that, Rebecca is still working an insane amount of hours. She may be facing 19 straight days without a day off, and now my hours are starting to go up at my "real" job as we head into the Halloween season. Add to this the fact that I'm always so tired because of the medication for my chronic pain, and it's been hard to get anything done, and unfortunately, blogging is pretty far down my list of priorities. I had planned on doing more blogging this month, but so far, that has been a complete failure. Life has just been too crazy busy of late to get stuff done. Eryn is doing marching band this year, and her first football game was last week, so we of course went to that. Then on Saturday she had her first competition, which meant being at her school at 7 in the morning. By the time we got home, it was almost 11 at night. Her band finished last in the competition, but they were also the smallest of all of the bands performing. Her school just doesn't have the funding to put together a really strong band, and I think this is a perfect example of yet another failure in American culture. We pour tons of money into the schools for football, basketball, and other sports, but ever time something has to be cut, the first thing that is attacked are the arts. This is a huge failure. While sports are important, the arts are even more important, but American culture no longer recognizes this. In addition to all of Eryn's band stuff, Juliah started back to school, which of course means tons of shopping, tons of preparation, and in addition to all of this, Rebecca is still putting in a lot of hours, most weeks working six days, and while I'm not working a lot, I am working opposite of her schedule, which is stressful, since we're the type of couple that actually likes and wants to spend time with each other, so that puts a strain on both of us. I have managed to get one of the books formatted that I needed to do, and I've started work on the second book that I need to get done, but I still haven't managed to make it to the post office to send off copies of The Martian Wave: 2015, but I am trying. Hopefully this week or next I will be able to get there. The meds that my doctor put me on are helping with the pain, but unfortunately, they're still making me dizzy, and this reached a bad point yesterday when I was going to switch out some laundry. As I got to the door, I felt very dizzy, so I grabbed onto the door frame. The next thing I knew, I was on my back with my head bouncing against the floor like I was having a seizure, and my foot in the litter box. Apparently I blacked out. The worst part was that the only person that was here at the time was Alexis, so if I'd really been hurt, I might have been in trouble. I'm not sure if this means that I should try to switch meds, because I really don't want to. These meds are working, and even though I still have pain, it's nothing like I used to have. I actually feel like a functional human being again. Last month was a very light month of blogging for me. Mostly because there were a couple of weeks there where I wasn't able to focus much. I had a nasty respiratory infection for a while that included a high fever, even forcing me to miss work (which I try my best not to do). Shortly after that, I went to the doctor about my chronic pain. We were able to get a referral to a surgeon, so hopefully at some point I'll be able to get in and see him, and maybe we'll get some answers. In the mean time, my doctor put me on a new med for the pain, which actually seems to be having an effect. However, and there's always a however, the medication has some difficult side effects. For one, I'm dizzy quite often. So much so that I actually did black out at one point, and at other times, I get these crazy tremors as I'm trying to regain my balance. In addition, I'm also much more tired than usual. All of this made for many unproductive weeks. Now, I have to play catch up. I still need to get the copies of The Martian Wave sent out. I have two short story collections I need to edit for Nomadic Delirium Press. I have e-books to format, and who knows what else. It's going to be a busy September as I try to make up for everything I didn't get done in August. A new issue of The Fifth Di... is now available, and it's still just $1!!!! The Fifth Di..., one of the longest running on-line zines continues on with four new stories. This month we feature fantasy and science fiction stories from Fredrick Obermeyer, Tim McDaniel, Kate Runnels, and Thomas Canfield. The exploration of "Deep Space" begins. 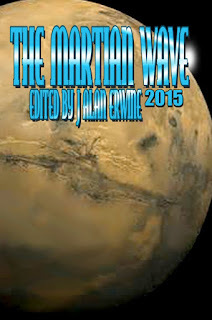 The Martian Wave: 2015 is here! Today is the official release of The Martian Wave: 2015!!! The Martian Wave: 2015 brings you stories and poems that look at humanity’s exploration and colonization of space, with a special emphasis on our solar system. Within these pages you’ll find stranded astronauts, potentially dangerous aliens, people struggling with dangerous indigenous life, and dangerous thoughts from their own minds, plus much much more. There’s just one week left to pre-order The Martian Wave: 2015. Go to http://nomadicdeliriumpress.com/tmw.htm, and order your copy today. Regular readers of this blog know that I suffer from chronic pain, and I do get an occasional e-mail asking how I'm doing, so I figured an update was in order. The simple answer is...not well. The pain has gotten quite a bit worse in the last couple of months with an average day being around a 3 on a ten point scale. Although that might not sound bad, that's constant pain no matter what I'm doing. At best, I occasionally have a day where I'm at a 1, but those are becoming more and more rare, and I never have a day where I don't deal with pain. The last week has been especially bad with the pain level being up around a 5, and last night I overdid it at work while helping to move some boxes around. After I was done, I actually almost blacked out from the pain, and this morning I'm up around a 6 or 7. If I stop moving and breathing, it helps ease the pain, but I don't see those as viable options at this point in time as a long term cure. Now that I have insurance again, we're trying to get me in to our doctor, but so far, he hasn't had appointments that fit our schedule. We're both working, and we have back to school for the kids, so there aren't many options for us at this time. Rebecca absolutely has to go to the appointments with me since this is going to certainly have an impact on her, since I'm now pretty much convinced that I will eventually have to go under the knife, especially as long as I continue to work in retail, where lifting is almost a must. All of "Unexplored Space" can now be yours to explore, and it's all in one volume. This book outlines everything of interest in Sectors 22-41 of the Ephemeris universe. Find new species, new mysteries, the ruins of ancient civilizations, and unexplored worlds just waiting for exploration. A while back, I started publishing some of my previously published short stories on Smashwords. Life, editing, and other factors kept me from working on that for a while, but I'm now back to listing my stories there. Most of the stories are available for just 99 cents, but two of them are free. If you'd like to check out some of my previously published works, please feel free to visit https://www.smashwords.com/profile/view/jaerwine. And if you like any of the stories, PLEASE write a review. We smaller authors are dependent upon reviews from readers. The exploration of “Unexplored Space” concludes with Sectors 39-41. There's been a lot of talk since the Hugo nominations came out about what science fiction publishers should be publishing. I figured I'd weigh in with my two cents (for what they're worth). The answer for me, as an editor, comes down to a good story. When I'm reading submissions, I don't care whether or not the person has some agenda in their story, and I don't care if the story is nothing more than a rousing space opera like the "stories of old." I simply want to read a good story that is well written. And by well written, I don't mean that it lives up to some standards set forth in a college English class. What is a good story? Something that holds my interest. Like every other editor, I have my own personal beliefs (religious, political, etc. ), but a good story doesn't have to fit with my beliefs. I'm an Atheist, but I've published a lot of good stories that have definite religious overtones. Why did I publish them if they didn't fit my beliefs? Because they were good stories. I'm a progressive, bordering on liberal, but I've published stories that had definite conservative overtones. Why? Again, because they were good stories. I know for a fact that I have published at least one author who was on one of the puppy slates, and I don't care. He's a good writer, and if he sends me a good story, I will still publish him. I really don't care about all of the political infighting that's going on in the field. My goal is to publish the best SF and fantasy that I can get for the small payments we can afford. If it doesn't match my beliefs, fine. If it doesn't match the beliefs of the majority or the minority in the field, fine. I just want to publish good stories. Today only you can get a pdf version of The Martian Wave: 2014 for just $1.20. It usually lists for $3.99. Simply go to http://www.drivethrufiction.com/product/129608/The-Martian-Wave-2014, and get your copy today. The Martian Wave features stories about the exploration and colonization of space, with special emphasis on our solar system. In this issue, you'll find alien microbes and aliens that are like nothing you've ever imagined. You'll be taken to icy worlds, and the sands of Mars. You'll even get a look at Earth trying to regain its place in the stars. Step inside, and be transported to places you've never imagined...maybe even places you never could imagine. In the last couple of days I've noticed that my last two collections, A Robot, a Cyborg, and a Martian Walk into a Space Bar and Taurin Tales have both had some Kindle sales, so I decided to go over to Amazon and look at the webpages. You know, see where their sales rankings were and see if anyone had reviewed them. Much to my surprise, I found out that the print versions of both titles were listed as out of stock. The only reason I can think of for this is that the publisher, Nomadic Delirium Press, did not give Amazon the usual 55% discount that they ask for. The reason they did this is because the profit margin is already very small, and in order to give that kind of discount, either the publisher has to take almost no money (as these are royalty paying books, this also means that the authors make less money), or they have to price the books much higher, which puts them out of the price range for a lot of readers. This is the dilemma that many small press publishers face. Amazon does, of course, offer an alternative, which is Create Space. However, Create Space does not have the distribution that most small press publishers would like. It's very difficult to get a Create Space created book on Barnes & Noble, and traditionally, my books (those that I've edited, and those that I've written) have done better at B&N than they have at Amazon. Six Ephemeris supplements are now available as paperbacks from Amazon. This will almost certainly turn into a rant, so if you don't like my rants...you might want to move along. For a few months last year, I was on Medicaid. The simple fact was that it was too expensive to put me on to Rebecca's insurance. Doing that would have meant taking food from our kids' mouths. The actual truth is that as a family of five, we could have all qualified for Medicaid, but we wanted to keep private insurance for Rebecca and the kids because we wanted to keep our regular doctor, and we felt a lot more comfortable with having the choices a private insurance company offers as opposed to having to go to a Medicaid doctor. Plus, we weren't really looking for charity. We believe in hard work, and we felt that we didn't need a government "hand-out," as some Republicans would call them. So, I was on Medicaid and then I never responded to a letter that I didn't even get, so I was booted off the program. I wasn't too worried about it. Sure, we had to pay a small fine on our taxes, but it wasn't really a big deal. Our income is low enough that we qualify for a lot of tax breaks, so whatever. Some people reading that might just shrug it off, but I work around 15 hours a week at barely above minimum wage, so how I could make too much money escapes me. Even if you add in what I make from writing, editing, and game design, as well as what Rebecca makes, we're still well below middle class for a single person...let alone a family of five. So, how in the hell do I not qualify? I did some research and found out that our income is actually low enough for me to qualify, so why didn't I? The only answer I have is that the government systems are entirely corrupt. This isn't our first experience with these types of problems. When the Office Depot I worked for closed and I was laid off, I tried to get unemployment, and it took me more than six months to get that. During that time, we had to get food stamps. There was simply no choice, but we got booted out of that program after they sent us a letter saying that someone else was living in our home...someone we'd never heard of. Our calls and letters to the office were never returned. Finally I got unemployment, and we let it go. Eventually, I got off of unemployment when I was hired by OfficeMax, and just so that people understand that we aren't the type of people that abuse the system, I was making more on unemployment than I was at OfficeMax, but again, we didn't want the handout, so we decided it was better for me to be working, even if it meant our family would have to struggle more. So, I ask again, how screwed up is this system in Colorado that I can't qualify for Medicaid when we have to struggle to pay every single bill we have? We don't go out to eat all the time. We don't waste money. We don't do drugs, drink, or even smoke, and yet somehow we keep getting screwed over by the system. No matter what the government says, it's always the poor that get screwed. The regular followers of this blog know that I occasionally blog about my dealing with chronic pain, and this is another such blog entry. For over a decade now, I've been dealing with pain that's caused by a reconstructive chest surgery I had when I was a teenager that has slowly been breaking down. Unfortunately, the deterioration seems to be increasing. It used to be that I had pain in my two lower left ribs, but now I'm beginning to have pain all through my chest...in all of the ribs and in the sternum. It's also become painfully obvious that my sternum is collapsing further into my chest. Although that may sound scary, it actually isn't. The collapse is very slow, which, unfortunately, is causing me to have shortness of breath. The odds of a rapid collapse that might puncture something are extremely small, so I'm not really worried about that. My biggest concern is the increasing pain. The other night at my oldest's honor band concert, I went to put my arm around Rebecca and felt a few of my ribs pop, meaning that I couldn't even put my arm around my wife to enjoy our daughter's performance. It's now gotten to the point that I can't go out and play volleyball with the oldest, or soccer with our middle daughter, or pick up my youngest and play with her like I used to. It's very depressing, but I know that just about anything I do can cause pain. Last night I took a deep breath and felt a rib pop and the pain increased dramatically. It's obvious that at some point I am going to have to have surgery to repair this, but that's not something that is even remotely feasible at this time. I am uninsured, and the cost to put me on Rebecca's insurance right now would mean that the family would be eating ramen for a long time to come, and it would also deter our plans of getting our own house. Hopefully she will get promoted before the next open enrollment, and that will at least make it a little easier, but such a dramatic surgery would put a real strain on us, as I would be useless for quite some time...something I would not deal well with. Dealing with this pain, it has become quite clear to me how some people can be driven to suicide by chronic pain. Don't worry, I'm not suicidal. I have an amazing wife and three wonderful daughters, so I wouldn't do something like that. I'm just saying that the pain, the feelings of uselessness, and the depression could certainly lead someone to make that decision. For now, I just have to do whatever I can to avoid things that will cause pain, which is almost anything. I have to take it easy when I'm cleaning the house, when I'm at my "real" job, and just about anything else. For the next week, you can get the e-book version of the role playing game The Battle for Turtle Island: Buffalo Wars for 50% off…that’s just $2.50. Go to https://www.smashwords.com/books/view/291831 and use coupon code XF49R at checkout. Imagine it’s the 19th century, and the colonization/conquest of the Americas is underway yet again, only this time magic is real, and the Indians have a lot more of it than the colonists. This is the world of The Battle for Turtle Island: Buffalo Wars. The colonists may have the better weapons, but the Indians nearly double the magic of the colonists. Maybe this time the history of the Americas will be very, very different. The Battle for Turtle Island: Buffalo Wars is actually two books in one. It has the core rules for The Battle for Turtle Island RPG, which will be a series of books featuring the different parts of the Americas, and it also has the Buffalo Wars supplement which looks at the battles for the plains. You can choose to be a Cavalry Soldier, an Arapahoe Medicine Man, a Colonist Trapper, an Apache Warrior, or any number of other classes, and your character can choose to change classes as they advance. This book contains, the character classes, the special abilities for each Indian tribe, the goods, the spells, and much more. The only other thing you’ll need to play is some dice and a vivid imagination. The bills are starting to roll in for Rebecca's recent surgery, and once again it's time for me to gripe about healthcare costs, and the screwed up American healthcare system. The hospital attempted to bill the insurance company over $45,000 for the procedure and recovery. This doesn't even include an overnight stay. She was discharged the same day. Granted, the insurance company negotiated a lower cost, but it's ridiculous that things are this expensive. True, a big part of medical costs are caused by frivolous malpractice lawsuits brought about by less than scrupulous people, but you can't honestly expect me to believe that it cost the hospital that much money for my wife to be there. Even with a healthy profit margin, that's still insane. Especially given the fact that the insurance company was able to negotiate a lower price, that shows that hospitals are overcharging. It's also interesting to note that the insurance company is negotiating a larger percentage discount on bills now that we've paid our deductible...meaning that they have to pay 90% of the coverage. This also tells me how corrupt the insurance companies are. I still believe that Obamacare was a step in the right direction, but we still have a very long way to go if we want a healthcare system that truly works. Today only, you can pick up the PDF version of the Ephemeris Role Playing Game from DriveThruRPG for just $1.59 by going to http://www.drivethrurpg.com/product/63664/Ephemeris?src=DotD&from_home=1. The exploration of “Unexplored Space” continues with Sectors 36-38. There are a lot of new planets to explore in these sectors, and there are places that have even been colonized, some of which see almost constant war. There are the remains of more Glikth-machine wars, and a species that has only recently died. We've been home for a few days since Rebecca's surgery, and her recovery is progressing slowly. Her pain levels have finally dropped off to something a little more manageable, especially since she stopped taking the pain meds. They seem to have been giving her very serious headaches and neck pain. She has had a low grade fever from time to time, but nothing that points to an infection, but I'm still keeping a close eye on her...and she'd probably say too close of an eye. She is now able to get up and move around a lot easier without my help, so she definitely seems to be on the road to recovery. We are now just a few days away from Rebecca's gallbladder surgery, and although this surgery is very routine, and it's done all the time, it's still surgery. There is always that chance that something could go wrong, and this is becoming very "real" for all of us. It's only been a little over a year since she lost another brother, and given the number of people that have passed in the science fiction/fantasy community over the last year (both writers and fans), including people that I considered at least good acquaintances, if not actual friends, it makes the fear that much more real. Add to this the passing of a former co-worker just a few weeks ago, a lady who we called the Den Mother because she always tried to take care of all of us, and the fact that a very dear friend checked himself into a hospital last week because he was suicidal, makes death a very real aspect in our lives right now. We all realize that gallbladder surgery is nothing like brain or heart surgery, but there's still that big "what if?" Rebecca's not just my wife and the mother of my children, she is, without a doubt, the best friend that I've ever had, and the thought of losing her is terrifying. Add to this the fact that the kids are worried about her, and a couple of them are acting out in different ways is just making things that much harder. I realize that almost certainly in a week's time I'll be looking back at this post and thinking how silly it was to be this nervous...but for the moment, the fear is beginning to set in, and that's more real. and use coupon code ZQ47N at checkout. Today was Eryn's 14th birthday. It's hard to believe how much she's growing up.. When Rebecca and I first started dating, Eryn was just in Kindergarten, and now she's about to start high school. Tonight she was also inducted into the National Junior Honors Society. She's turning into my overachiever, and I'm very proud of her. She's getting good grades, she was on the A team in volleyball, and she's participating a lot in everything at school. Through the end of the week, DriveThruRPG is running a GM's Day sale to celebrate those gamers that make gaming possible. We've joined in the sale, and we're offering all of our Ephemeris products for 30% off. Now's the time to stock up on all of the titles you haven't had a chance to pick up, or if you haven't started playing...now's the time! Alban Lake Publishing has three of my books on sale through March 17th. You can pick each of them up for just $8 each. There has been a lot of talk about the disappearing middle class in America. After doing our taxes last month, I can attest that the middle class is most certainly disappearing. We are middle class, or at least lower middle class, and every year becomes more and more of a struggle for us. When we first moved in together, I left my fast food management job, but Rebecca kept her full time retail supervisor's job. Those first years were difficult for us, but we got by...even if just barely. Now, almost seven years later, Rebecca is still a full time retail supervisor, I'm now working part time as a retail supervisor, and I'm making more than ever from writing, editing, and game design, and we aren't making ends meet. The simplest explanation is that the cost of everything is rising dramatically, while our incomes are not. When we get our annual raises, we get 2-3%, but the cost of everything is rising much higher than that. Our rent goes up about 5% annually, and everything else follows suit. It's no wonder that people making middle class income, especially lower middle class income are struggling more and more each year. We can't keep up with rising costs, and as long as pay rates stay low and don't increase accordingly, all of us in the middle class will continue to struggle. The exploration of “Unexplored Space” continues with Sectors 30-32. Last night I started on a new story, and it was going really well. I managed to get 1,500 words written, which is good considering I have three kids, but then I suddenly realized I had done the one thing that authors hate most...or maybe it's one of the many things authors hate most. I'd painted myself into a corner, with no way to get out. Somehow I'd gone left when the story should have gone right. The book is finally here! You can order your copy, print or electronic, today from a wide variety of sources. A Robot, a Cyborg, and a Martian Walk into a Space Bar is a serious literary work of science fiction and fantasy stories that looks to delve into...who are we trying to kid? This book is a collection of comedic science fiction and fantasy stories written by some truly talented authors. You'll be taken to alien bars, alien planets, and any funny place these authors could come up with. You'll meet meddling appliances, aliens with strange habits, and aliens trying to live on or visit Earth. There are even time flies and a cloned genius. This collection has everything you need to tickle your funny bone.